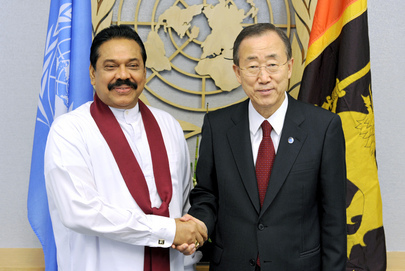 At UN on Sri Lanka, Ban Ki-moon Didn't Even Submit Panel Report to Geneva, "Could Still Happen" - But When? UNITED NATIONS, August 15, updated with transcript -- Asked about an editorial accusing UN Secretary General Ban Ki-moon of being "lax" on countries such as Sri Lanka, Ban's acting deputy spokesman Farhan Haq on Monday countered that Ban had "on his own authority appointed a Panel of Experts" on Sri Lanka. Inner City Press asked if Ban had even transmitted the Panel's report to the Human Rights Council, and if he finds it unfortunate that the Human Rights Council did not take up or act on the detailed report. Haq replied that the Panel's report has "not been formally submitted by Secretary General at this stage although that could still happen in the future." Earlier this month, representatives of a number of member states asked Inner City Press why Ban never transmitted the Panel's report to the Human Rights Council. "This sent a message," one representative told Inner City Press with a shake of the head, "that Ban doesn't really want action on his own report." The representative went on to marvel that Vijay Nambiar, who was involved in the white flag killing described in the Report, has been allowed to play any role in the review and (in) action on the Report. Now some in the Ban administration imply that the report has been held back. For leverage or due to a lack of commitment? One Ban administration representative told Inner City Press, on condition of anonymity due to fear of retaliation and firing, that if Ban has any leverage, he would use it for "more pressing" topics than Sri Lanka. Meanwhile Ban's Office of the Spokesman is reducing question and answers by 40% by canceling noon briefings; lead spokesman Martin Nesirky will only return on August 29, if then. Ban has returned from South Korea, but will try to take this week off. An article in the Canadian press about the cut back in question and answer time quoted Inner City Press asking Haq "How did you decide to say that journalists here want less information rather than more?" and an unnamed UN official that the "coming week looks to be pretty calm." Watch this site. Inner City Prss: There is an editorial in the Guardian that came out over the weekend, called “United Nations: Weak leaders wanted”, and it is, one of the lines is: “China, Burma, Sri Lanka have benefited from Mr. Ban’s lax hand. To save his legacy he must refresh his top team with people who understand the UN’s principles.” What’s the UN, what does it think of this editorial and is there a plan to actually make some kind of a shake-up; not necessarily obviously in response to this editorial, but what’s the response to that analysis that weakness on Sri Lanka, Myanmar, et cetera, have stained the UN’s legacy? Acting Deputy Spokesperson Farhan Haq: First of all, as you will no doubt be unsurprised to learn, I don’t agree with that particular evaluation. On Sri Lanka, for example, the Secretary-General, acting on his own authority, did create a Panel of Experts under the leadership of Marzuki Darusman, which came out with a report which to this day is one that we believe is worthy of study and further action from Member States. We do believe that there are many issues on which the Member Governments of the United Nations themselves need to take action. But on cases where they have not done so, as you know, the Secretary-General has taken it upon himself, as in Sri Lanka, and indeed as in his own good offices efforts in Myanmar. Beyond that, you’d also asked about whether there would be a shake-up. Of course, there is no point or intention to do any shake-up in reaction to any editorial or indeed any articles here or there. 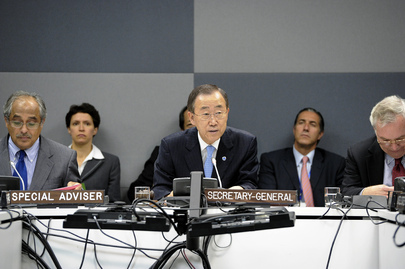 But the Secretary-General, as you are aware, will be starting his second term in office in January. And he does expect to make different moves and reinvigorate and revitalize his team for a second term. Inner City Press: Just one follow-up on that, just on the Sri Lanka side, because I guess there is a sort of a difference of opinion. Did the Secretary-General ever transmit that report to the Human Rights Council? I mean, more just directly, does he think it is unfortunate that action wasn’t taken in this session, all of which took place after the report was released? Did he ask them to take action or is there some future goal to transmit it? Acting Deputy Spokesperson Haq: First of all, as you know, the report is a public document. It has not been formally submitted to the Human Rights Council by the Secretary-General at this stage, although that could still happen in the future. Right now, what we expect and hope to see is that concerned Member States who are now appraised of the contents of that report will take it up and push for something further. As you know, the report has a number of recommendations, including for further investigation and for further efforts at accountability. And we believe that they need to be taken up very seriously.